When I became president of Hispanic 100, I sought out founders Delia Reyes and Bertha Outler. 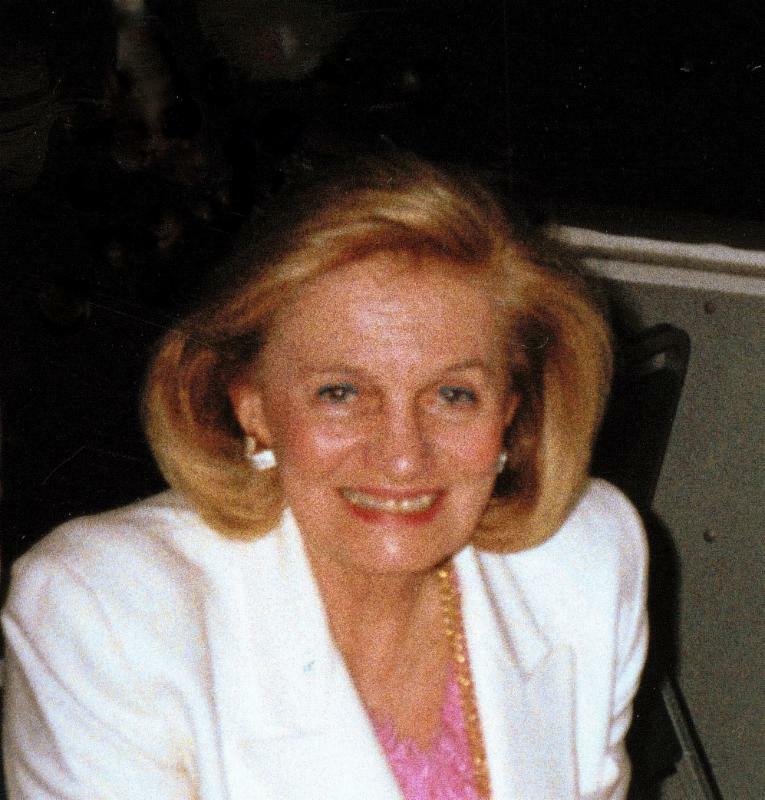 Our third founder, Patricia Asip, passed away in 2010. I wanted to reconnect with these two iconic and visionary Latinas who have long-served as role models to me and many other Latinas. What many may not know is that I was nominated by Bertha Outler to be a part of the original Hispanic 50 in 1996. She put me on a path to connect with other leading Latinas in Dallas, many of whom shaped and influenced my career and remain extraordinary colleagues and comadres to this day. My purpose in meeting with Delia and Bertha was also to reconnect with our history to prepare for our 20 th Anniversary. I wanted their perspective on how to honor, recognize and celebrate this milestone. I asked why they embarked on the journey. They simply and eloquently shared their vision – To create a network of influential Latinas. Their vision has come to fruition, and over the past 20 years, our organization has grown to include 78 Latina leaders representing diverse backgrounds while sharing a common thread – influence through leadership. 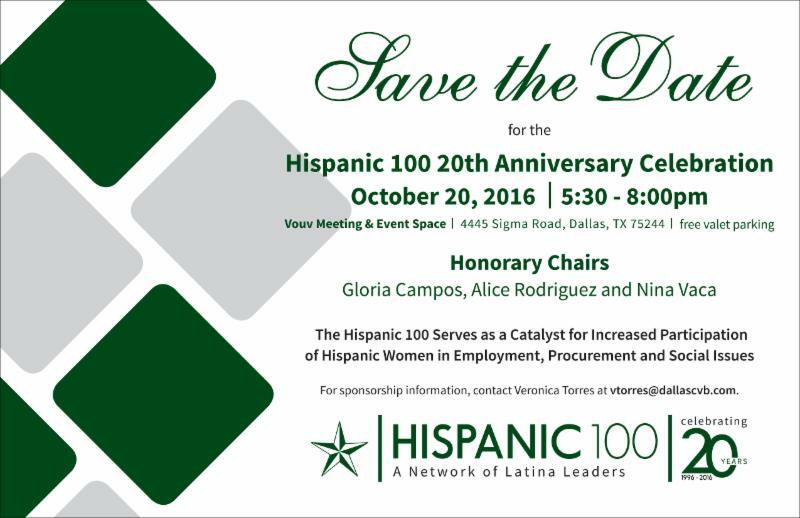 At our 20 th Anniversary Celebration, we are excited to share Hispanic 100's story and highlight the impact and contributions of many outstanding Latinas. We’ve chosen the theme Latinas: Women Who Influence to aptly and vividly reflect the strength and impact of women who represent our past, present and future. We look forward to sharing an amazing evening with you October 20, the vision of our founders, our story, and the outstanding contributions of many our members. The H100 Programs Committee is delighted to announce Linda Valdez Thompson and Ellen Castro will present a leadership program titled Serve from Your Strengths and Soar at the HWNT State Conference in Irving. While we know each of you are already soaring, this session is the perfect opportunity to revisit your strengths and network with HWNT members. To get the maximum benefit out of this thought provoking hour-long program, obtain a copy of Strength Finders 2.0 by Tom Roth, complete the assessment (which creates the Top 5 Strengths Finder Report), and bring it to the session. We look forward to seeing you there! 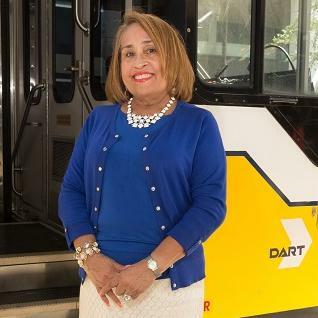 Carmen Garcia has been elected the first Latina president of the Conference of Minority Transportation Officials (COMTO) out of 39 chapters across the state. The North Texas Chapter, which she leads, serves senior level minority professionals at NCTCOG, DART, DCTA, The T, DFW Airport, Dallas Love Field, TXDoT and Texas Central Partners in engaged advocacy. Congratulations Carmen! The H100 hosted the first-ever Member/Sponsor Appreciation Networker on August 2 at Maggiano’s. President Cris Zertuche Wong welcomed past and potential sponsors. She also highlighted H100 members who received honors in 2016. Diana Aguirre spotlighted new members while Veronica Thomison, provided news on the H100 web site. 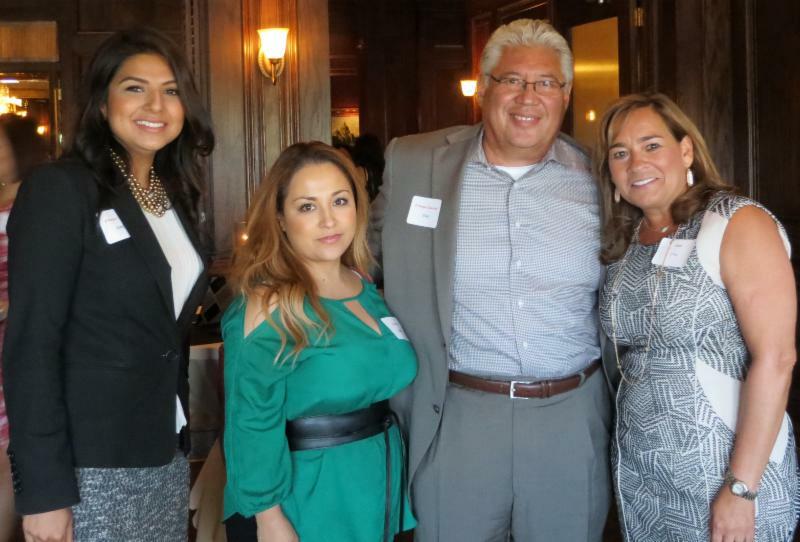 Veronica Torres and Jessica Narvaez provided updates on our 20 th anniversary event Oct. 20. Special thanks to Gloria Tostado Hann and Ellen Castro for creating an inaugural event that brought so many together in the spirit of true networking. It also recognized the wonderful women that comprise this organization and all that they do to improve and give back to our city. As part of the College Bound Initiative at Irma Lerma Rangel Young Women's Leadership School, a mentoring program pairs high school seniors with professional women — preferably ones who work in a field the student is interested in pursuing. Mentors meet with their mentees on campus (at 718 Robert B. Cullum Blvd.) once a month either during lunch or after school (at 3 p.m.) from September until April. The program requires a brief online application. Once accepted into the program, all new mentors are required to submit a DISD background check. Once matched with a senior, mentors are asked to donate $60 to Young Women's Preparatory Network to help cover the costs of lunches and snacks during the program. The first session is this Friday, Sept. 16 at lunch, so act fast! For more information, please call Katie Albritton at (972) 749-5527. Silvana Rosero started her professional career 19 years ago as a Public Relations Coordinator at the second largest airline in Colombia, South America. While there, she was part of the team that successfully introduced the first Airbus 320 jet fleet to Colombia, coordinating simultaneous special productions with the public relations division of Airbus Industrie in Tolouse, France. In 1998 she moved to the U.S. and worked in several roles both as a journalist and a bilingual marketing professional. 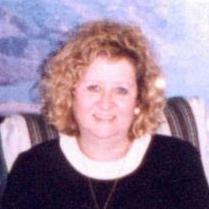 In 2003 Silvana was asked by Small Pond Video Production’s founder, Gary Wall, to join the team as a Producer. Little did she know she would become an entrepreneur a year later when Small Pond’s founding partner offered Silvana an opportunity to become a partner in the business. Ten years later, Silvana Rosero runs the company as its President. Her company is a Certified Woman and Minority Owned Business, and most recently has been recognized by the Greater Dallas Hispanic Chamber of Commerce with the Quality and Excellence Groundbreaker Award and by Oncor with the Supplier Diversity Rising Star Award. Silvana holds a Bachelors Degree in Corporate Communications and Journalism from the Universidad Pontificia Bolivariana in Medellín, Colombia and is a 2014 graduate from the GDHCC Executive Entrepreneur Program. Beatriz Manetta emigrated from Argentina to Elizabeth, New Jersey as a young girl. 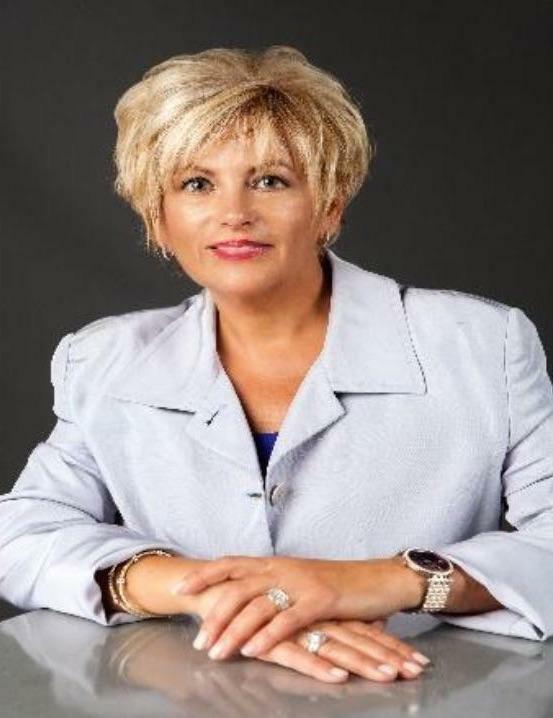 She has a Bachelor of Science in Marketing and Accounting from Rutgers University and holds a Master of International Studies from Seton Hall University, where she received the Beta Gamma Sigma Award for contributing significantly to the vitality and strength of the economy, combining business achievement with service to humanity. She worked in corporate America for twenty years. Argent Associates was launched in 1998 and Asociar in 2012, both under the helm of Ms. Manetta as President & CEO. Both built a reputation by having and maintaining an impeccable reputation for quality and work ethics, as well as working towards exceeding customer expectations in all they do. Manetta serves on the Fairleigh Dickinson University Supply Chain Management Advisory Board, the Greater Dallas Hispanic Chamber of Commerce Board of Directors, the Women’s Business Council Southwest Board of Directors, the DFW Minority Business Council MBIC Chair, and the Seton Hall University Board of Regents. She served on the President's Export Council (PEC), which advised President G.W. Bush on international trade matters and its impact on small, women and minority owned businesses. She currently serves on the board of the United States Hispanic Advocacy Association and QuEST Forum where she is an executive contributor focusing on small business and sustainability issues as it relates to quality. The Dallas Business Journal's 2016 Minority Business Leader Awards honored Nina Vaca, chairman and CEO, Pinnacle Group, with this year's Lifetime Achievement Award. The League of Women Voters of Dallas honored Regina Montoya, Chair of Dallas Mayor Rawlings’ Task Force on Poverty, with their Susan B. Anthony Award. 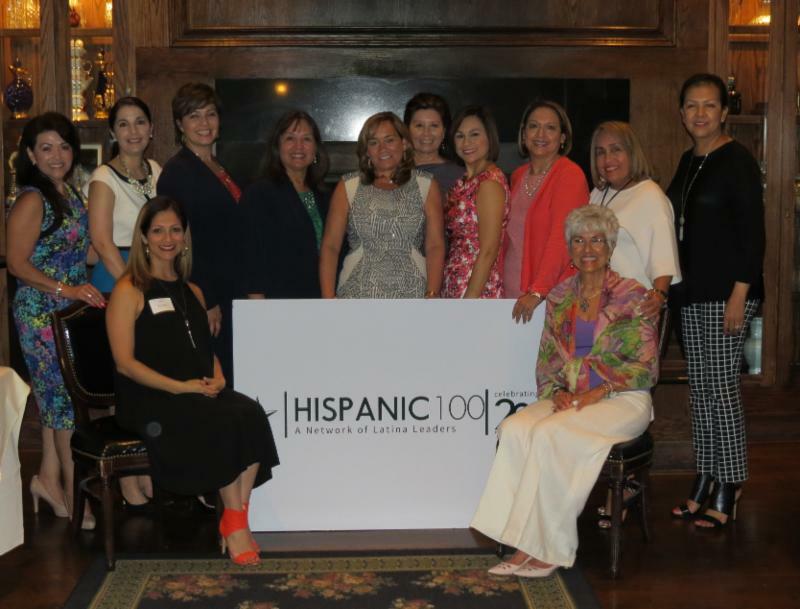 The Greater Dallas Hispanic Chamber of Commerce's La Cima Awards honored Irving Hispanic Chamber president & CEO Mary Ann Kellam as its Non Profit Leader and Dallas County Judge Sara Martinez as their Emerging Leader. From Ford Motor Company, Bridget Moreno Lopez received the Mujer Legendaria, Dallas Leadership Award, SMART category. At the Global STEM Talent Summit, Betty Manetta was named one of the 100 CEO Leaders in STEM (Science, Technology, Engineering, Math) by STEMconnector®. The Women’s Business Enterprise National Council named Patricia Rodriguez Christian, president of CRC Group, one of their “Women of Distinction” for 2016. Dolores Barzune received the Symphony State Award from the Texas Association of Symphony Orchestras as the Volunteer of the Year. 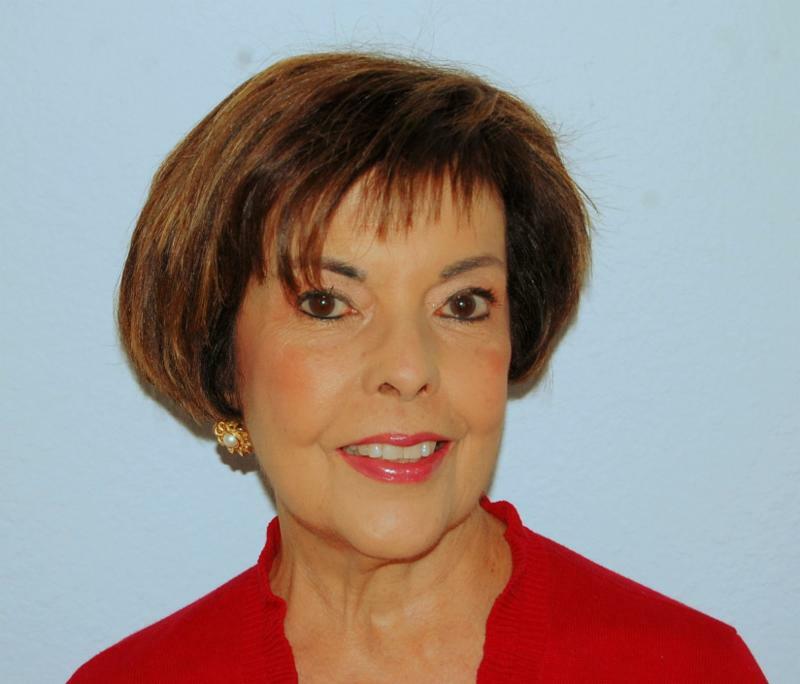 Ellen Castro, author and motivational speaker, received first place in the 2016 International Latino Book Awards, Self Help category, for her book entitled Happy in Spite of People. 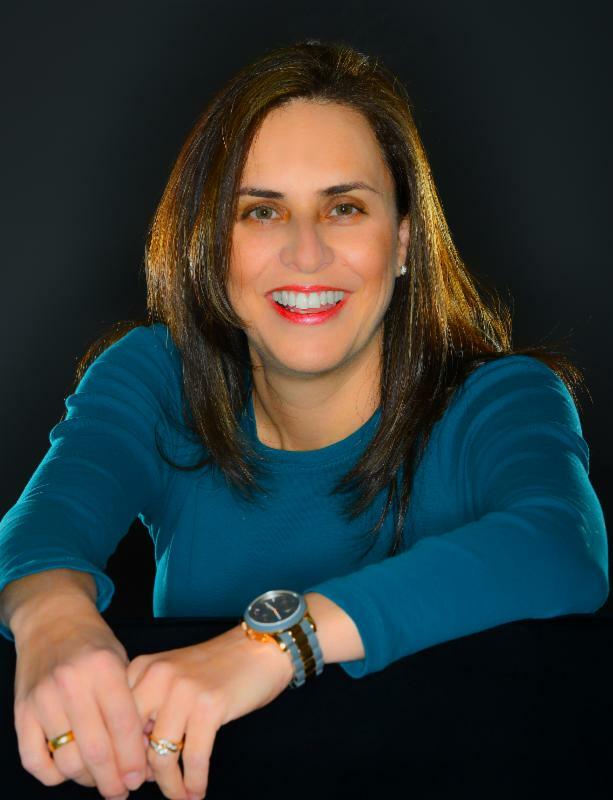 At the 2016 convention in Orlando, the Women’s Business National Council recognized Jessica Narvaez, Chief Diversity Officer at the Pinnacle Group, with an Applause Award. At the Journey Spirit Luncheon, where outstanding immigrant trailblazers were honored, Michele Bobadilla received the 2016 Immigrant Advocate Award, and Betty Manetta received the Immigrant Entrepreneur Award. Erma Saracho received the United Way 2016 Financial Fitness DFW Leadership Award. Sheriff Lupe Valdez, the only Latina Sheriff in the U.S., spoke at the Democratic National Convention in Philadelphia. Hispanic Women’s Network of Texas is honoring Dr. Catalina Garcia, physician and president of the Dallas Anesthesiology Group, as their 2016 Madrina of the Year at their 30th anniversary annual conference. Latina Style magazine honored the Vaca family by featuring sisters Nina, Jessica, Monica and their mother Amanda on their July cover, focusing on multi-generational Latinas in both civic leadership and entrepreneurship. D CEO magazine named Dallas CVB Director of Business Development Veronica Torres and El Concilio CEO Florencia Velasco Fortner as Latino Business Awards finalists for 2016.